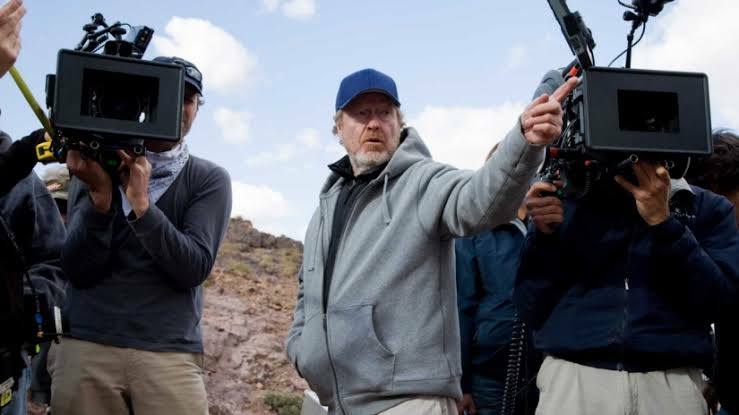 Sir Ridley Scott is going to produce and direct a new sci-fi TV series titled "Raised by wolves". "I'm always searching for new frontiers in the sci-fi genre and have found a true original in Raised by Wolves — a wholly distinct and imaginative world, full of characters struggling with existential questions: What makes us human? What constitutes a family? And what if we could start over again and erase the mess we’ve made of our planet? Would we survive? Would we do better?" said Scott. "Raised by Wolves" focuses on two androids tasked with raising human children on a mysterious, virgin planet. As the colony of humans divides over religious differences, the androids learn controlling the beliefs of humans is a treacherous, difficult job. More on this can be found on The Hollywood Reporter. Do it, Ridley. I can't wait to see it. If you was David and you wanted to Give Mankind a Second Chance, as the Covenant was trying to escape Earth and what that place had become, and to make a NEW Start. We could ponder "what kind of a World, would David Create" as RS had mentioned... and its similar to what i was intending with my Alien Covenant sequel Alien Ascension. But the reveal here of CHILDREN... is interesting, because if we assume David would give Mankind a Second Chance, then he would be cautious of all the KNOWLEDGE that Mankind has, because its Knowledge and Upbringing that Determine who we are... and REBELLION is a Large theme with the Prequels... Rebellion Stems from Knowledge.. IF David had gone on to Set-Up the Colony and he had intended to impose some of his RULE over them, he would Face Rebellion from some Colonist! However... IF he only raised those Embryo's and Children then he would have been able to MOLD any Rules/Beliefs upon the Humans raised from Childhood. If we ASSUME this is Davids plan, he would have Charade as Walter to awaken some Colonist, get the Colony Set up... then DO-AWAY with those Colonist... ONCE the Colony is Set Up to Support a Habitat and then Raise the Young upon this NEW Colony... that makes PERFECT sense from Davids POV. With RS not getting any younger and any ALIEN movies on HOLD... maybe RS is taking some of the ideas he had with the Sequels to Alien Covenant and applying them to his TV Series. RAISED BY WOLVES. We can all agree i think that PROMETHEUS was a ambitious and Bold Movie Plot... that as a STAND ALONE movie... if it never had Ships/Space Suits that looked like the Space Jockey/Derelict, if it never had as much Xenomorph DNA in the Organisms... and if it never featured the WEYLAND company, then as a Stand Alone Ambitious Sci-Fi Movie who knows how GREAT it could have gone on to becoming. its nice to see RS able to do a Sci-Fi TV Series where he can touch on some of the ideas he maybe had for the Alien Franchise but not showcase them in a NONE-ALIEN Franchise movie where he NOW had complete Freedom to Explore what ever he wants and be Restricted and also having to not worry about upsetting Alien Franchise Fans... with his Vision. The theme might be interesting (what it means to be human) but if they will add AI things into it then no thanks. I think that the visuals might be good since that is what he is very good at but AI is not very interesting to me for the moment, in part because of AC. If this is similar to what we would have gotten in a sequel to AC then I am glad that it is dead (at least that is what it seems right now). This could be a really good show. I like the concept itself although it would have taken the Alien series off course imo. While many of us likely look forward to the show and that it will be its own thing, we will know not so deep down that it's about David. And that is fine. Bring it on RS! "More android stuff? I will not watch this one"
I think it wont hurt to give this one a try, i know AI is not your Cup of Tea but it maybe provides a idea that would show maybe what RS may have to a degree incorporated into his Alien Prequels.. but without actually affecting any Alien Prequels. I think the MAIN thing to look out for is to see HOW WELL this show comes across both Visually and also showing us if RS still has what it takes to deliver a interesting Sci-Fi Story. Because a little Sci-Fi piece like this could give us insight into IF a Alien Franchise Spin of TV Series would actually work. If the Story to Raised by Wolves is Good, and Visually its a Good Sci-Fi Series, then it gives us hope that a TV Alien Franchise adventure could be Plausible or Not. Maybe Kevin Costner could play one of the androids. He's done stuff with wolves before. Maybe he could walk through some abandoned crops on the way to the playing field. Terminator is another thing because there the robots and androids already have an important role and it is more about them at least to a bigger extent, alien at least initially wasn’t about that. You can also raise questions from Terminator like where will the line between a robot and human do if we do robots like the Arnie robots? How is far is it acceptable to go when you create androids? What about robots and free will? To me these things fits the Terminator movies better compared to the Alien ones, that is the point. Sure the androids are a part of the alien universe but that is not what the alien movies are about and that is also not why I watch these movies, that is a difference. I can not decide if I prefer Terminator 1 or two the best, they are both good. Are there not more than two Terminator movies? I lost interest after the second one because it seemed repetitive with the rest. Since Scott effed it up in AC by focusing on the androids it doesn’t make me very interested in watching this – in other words, no thanks to this one. Scott will probably do fine visually with this one, he is good at that. Since it reminds me much of AC and since I was disappointed with AC it means that I will skip Raised By Wolves. If they will be able to make another Alien movie and if Scott will be involved then I will be worried that it will be another AC with weak characters and an over-reliance on androids. “I think the MAIN thing to look out for is to see HOW WELL this show comes across both Visually and also showing us if RS still has what it takes to deliver a interesting Sci-Fi Story." If you give him a good script he can do good with that by adding his visuals. Keep him away from the story or we will be given a mess, as AC shows. “So maybe this could be a sign that Plans for a Alien Covenant Sequel are CANNED…"
Aliens. I would like to see the Engineers or some related life-form having a bigger role in some way although I doubt that we will ever see that but at least it doesn’t seem likely that we will get another David movie, which is good. Like I have said before I would rather take no movie than another one that is boring. Scott turned AC into a movie about androids/androids as the focus and that was mediocre at best. He is insisting on making this one about androids too and since I was displeased with it in AC I will boycott this one. I will rather have no alien movie than another one about androids. Terminator is a whole other thing than the Alien franchise- it had that weird time paradox too. It is a great franchise if not analyzed too much- after all, it is sci fi and should be entertaining. It seems the Alien franchise has painted itself into a corner at least for full on movies. I am ok with AC ending like it did. I just imagine David will continue his quest and I don't need a 2 hour follow up movie. I agree that the series has gone off track and seems to have lost focus from the Quadrilogy. I say let it die in theaters and continue in different ways via streaming. You don't like AI? I do like the AI stuff but can agree it doesn't belong in a future Alien movie (that's why Raised by Wolves is in the works). IMO, the theatrical iterations should end and facets of the series should be explored via streaming, cable, books, comics etc. A new Alien movie probably will not put enough butts in seats to turn a decent profit anymore. I can see how you view (Thoughts_Dreams) that the ALIEN Franchise the AI was only something that appeared to play a LESSER role... Purely as a Servant the Company could use for its own AGENDA to pursue the Xenomorph where it fits in with being something that WOULD follow Orders with No Concerns for anything else... Trying to Get Humans to obtain the Xenomorph at the Cost of other Humans could back-fire because Humans have Emotion and Empathy and could then revolt against their Objective and Consider the Dangers and Life of the other Humans... A AI Assassin programed to Follow Commands with NO Free-Will would not be talked out of Carrying out its Assassination.. no second thoughts/concerns they would Perform the Task/Objective without Question. So this makes sense in CONTEXT to having ASH on-board the Nostromo. The Movie was about this Xenomorph Organism, its Origins a Mystery and the Companies Pursuit of it... the HUMAN Characters are only there to TELL the Story to make the Story and its Peril Hit-Home with us... where the better use of these Characters the better the Impact of the movie would be. Ignore the Human Characters then looking at the PLOT and what came before and after... or would have... then what we are left with asking is. *Where did this Xenomorph Originate from? *Why was the Space Jockey carrying those Eggs? what is his Connection to it? *Why are the Company so intent on obtaining the Xenomorph? These are the Broad Plot... which we never had any real deep explanation to any of these... And so ONCE we discover HOW/WHEN/WHY the Xenomorph was Created or where it came from.. and WHY the Space Jockey had those Eggs.. and then WHY the Company is Pursuing this Organism. Then whats left to cover is then to EXPLORE the Space Jockey and WHY and their Purpose and Agenda, and EXPLORE the Company and its Purpose and Agenda. And the Prequels had attempted this, but by bringing in the CREATION Element to those... which indeed seemed to BRING the AI Aspect to the Forefront and Relegate the Xenomorph to the Background. For a lot of Fans the ALIEN Franchise had to be about the Xenomorphs, and then Space Jockey where you then had to have Human Characters to incorporate and hit home the Story and so for some the AI/Synthetics should have been kept to a lesser role. But when looking at the AI and looking at a lot of the Agenda and Questionable things in the Franchise... Plugging in the AI Element helps to make some sense... for example with ALIEN 3 it makes more sense if Bishop was secretively working with the Company or their was another Secret Android who Bishop was aware of who had obtained those EGGS on the Sulaco. Its the explanation that best FITS. It is a chance for RS to show off to DISNEY/FOX that a Sci-Fi idea that does not concentrate purely on Xenomorphs and Heroines can be interesting. If this series Bombs and its Critically Attacked then IF we get a Alien Covenant Sequel it could more likely then be ALIENS MK2 with maybe a Aliens vs Predator Vibe (replace Predator with Engineers). The title of Ridley Scott's new series is sure a coincidence when looking back at the post-Alien:Covenant marketing, August 2017. I wrote the above topic about the Prometheus mural and the flashed images in response to the David's Lab teaser and when David mentioned "I finally found my wolf." When I read of the new series, in summary, 2 androids on a virgin planet referred to as wolves shepherding a flock of humans...that is quite a coincidence.